Wireless call center and retail workers from around the country convened in Hilliard, Ohio, last week to discuss strategies across workplaces and form a plan to demand better from the wireless industry. The workers are uniting to advocate for respect and good, family-supporting jobs in the wireless industry. On Saturday, dozens of Verizon Wireless workers, joined by AT&T Mobility and T-Mobile workers, rallied at the Verizon Wireless Center in Hilliard to protest the company shuttering the center and transitioning only some jobs to a home-based model. The closure will impact 500 current employees, and based on company statements, the number of jobs remaining may be significantly fewer than before, despite promises Verizon made prior to opening the facility to create new jobs in Hilliard. Verizon Wireless is also closing down company-owned retail stores around the country and turning the operation of those stores over to third-party contractors that often pay lower wages and where customers report complaints about service. Meanwhile, workers at T-Mobile are growing increasingly concerned about how the proposed merger with Sprint will affect their jobs. Recent CWA analysis estimates that the merger would result in the loss of more than 28,000 jobs across the United States. On Saturday, dozens of Verizon Wireless workers, joined by AT&T Mobility and T-Mobile workers, rallied at the Verizon Wireless Center in Hilliard, Ohio, to protest the company closing the facility. Last week, CWA President Chris Shelton wrote to all 50 State Attorneys General to express concern over the proposed T-Mobile and Sprint merger and to press for deeper investigations into the impact of the merger. CWA's analysis finds that the merger would result in the loss of more than 28,000 jobs across the country. Approximately 24,000 job cuts will come from the elimination of duplicate retail stores and another 4,500 will be cut due to duplicate headquarters functions. "The proposed T-Mobile/Sprint merger proves to be a much greater threat than benefit to consumers and workers," says Shelton. "We hope that State Attorneys General will heed our calls for a thorough investigation in order to protect both jobs and the competitive wireless market." Across New York State, CWA and New York's working people won big in last Thursday's primary election. CWA members worked tirelessly to get out the vote throughout the last several weeks. CWA members knocked on hundreds of doors, made thousands of phone calls, attended rallies, and participated at candidates' events. CWA's winning candidates last week included Andrew Cuomo (Governor), Kathy Hochul (Lt. Governor), Tish James (Attorney General), John Liu, Jessica Ramos, Julia Salazar, Zellnor Myrie, Alessandra Biaggi, Tim Kennedy, and Jen Metzger (State Senate). Governor Andrew Cuomo has been there for us time and again over the years, from the Momentive Strike to advocating for Safe Staffing levels for healthcare workers, to standing with us in the fight for high quality telecom service. His victory, along with that of Lt. Governor Kathy Hochul and Tish James running for Attorney General, is a big win for New York's working people. The State Senate wins represent a huge shift in New York State politics. Several longtime incumbents who have betrayed working people again and again lost their seats to fresh faces who are committed to fighting for us. When we fight, we win! Across New York State, CWA and New York's working people won big in last Thursday's primary election. 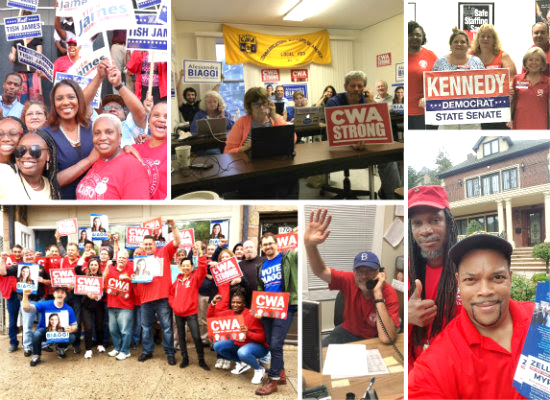 CWA members worked tirelessly to get out the vote throughout the last several weeks. Check out more photos from the Primary Election Season here! National Voter Registration Day is coming up on Tuesday, September 25! Are you, your family, and your friends registered to vote in the November elections? In some states, voting laws have changed. Make sure you prepare yourself in advance of the election. You can check your registration here and if you're not already registered to vote, register today. 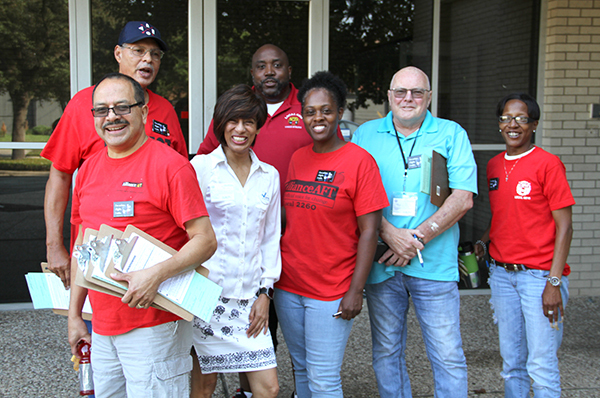 Last week, CWA Local 6215 members in Dallas, Texas, led a union coalition along with AFT community activists in their third annual voter registration drive before the 35th annual Alan Ross Freedom Parade (Dallas Pride). The volunteers were successful in registering nearly 50 new voters. First row left to right: George Rangel of AFT, Saadia Khalil, Rona East of AFT, Brian Cummings, and CWA Chief Steward Jennifer Daniels. Back row: Tony Chenevert of AFT and CWA Local 6215 Executive Vice President Earnest Tilley. The National Labor Relations Board was created in 1935 to help protect the rights of workers to organize and bargain collectively with their employers and to participate in collective action to improve their pay and working conditions. NLRB members are appointed by the president. Instead of protecting working people, President Trump's appointees have been trying to roll back progress workers have made and further rig the system in favor of employers. Their latest target is email communications. In 2014, CWA filed charges against Purple Communications for restricting the ability of members to use work email outside of work to discuss workplace issues. In a major win, the NLRB ruled in favor of the workers at Purple Communications, recognizing that email has become a critical means of communication about working conditions and other issues. Employers have been targeting the ruling ever since, and are seizing their chance to overturn it now that a Trump-appointed, Republican-controlled NLRB is in place. The Board is currently asking for comments on whether or not to overrule the decision. The Board is also trying to narrow the "joint employer" rule. In the 2015 Browning-Ferris decision, the Board adopted a joint employer standard that helped ensure that employers who control workers' terms and conditions of employment are at the bargaining table. Narrowing this rule would allow employers to gain the benefits of workers' contributions without being held accountable, and would incentivize employers to use more temps and contractors, instead of using full-time employees. In July, the Trump administration, siding with corporate interests against workers, proposed to revoke parts of a 2016 rule that requires employers to report workplace injury data to the Occupational Safety and Health Administration (OSHA). The new proposal will allow employers to hide their injury records and keep workers, the public, and OSHA in the dark about injuries and illnesses occurring in U.S. workplaces. It will make it harder to identify dangerous workplaces and to take action to prevent them. Read the full AFL-CIO fact sheet about the 2016 Injury Tracking rule and the proposed rollbacks here. To join the fight to protect workers, you can file comments online at Regulations.gov to tell the federal government that access to workplace injury and illness information is crucial to identifying hazards and preventing job injuries. The deadline for filing comments is Friday, September 28, 2018.